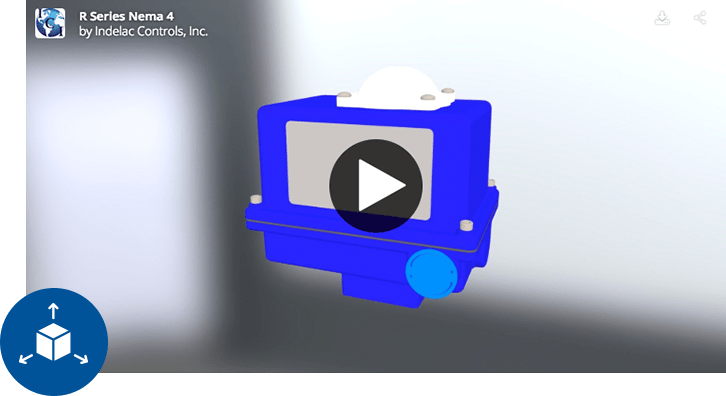 R Series Nema 4 | Indelac Controls, Inc. 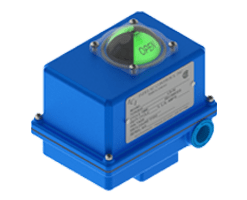 The R Series compact electric rotary actuator was specifically designed for small ball valves and dampers. This heavy-duty reversing actuator develops 100 lb in torque and rotates form 0 to 90 in 2.5 seconds. The spur gear drive train has been designed for severe applications and, as in all ICI actuators, can withstand stall conditions without suffering gear failure. The heavy-duty aluminum enclosure meets NEMA 4 specifications and has a thermally bonded ultraviolet-resistant polyester powder coating that not only enhances its appearance but also is a tough corrosion resistant coating. Standard equipment includes 115Vac-1ph motor with thermal overload protection, stainless steel fasteners, captive cover screws and 300 series stainless steel output drive, spring friction brake, non-declutching manual override and position indicator. Optional Voltage: 12Vdc, 24Vdc, 24Vac (24Vdc rectified) & 230Vac-50/60Hz-1Ph. with thermal overload protection and spring friction brake. Lock Rotor Current: 115Vac (std.) = 0.55 Amps. 208Vac/1Ph/60Hz = 0.72 Amps 24Vac = 2.40 Amps. Output Drive: ISO 5211 F03 (9mm female star) ISO 5211 F04 (11mm female star) 300 series stainless steel.